Bedrooms are an important part of our homes, considering we spend around one-third of our life sleeping. Further, our sleep quality also influences our performance during the remainder of the day and overall health. Sleep quality is affected by many parameters. The indoor environment, more specifically the indoor air quality (IAQ), is such a parameter that has started receiving attention only recently. 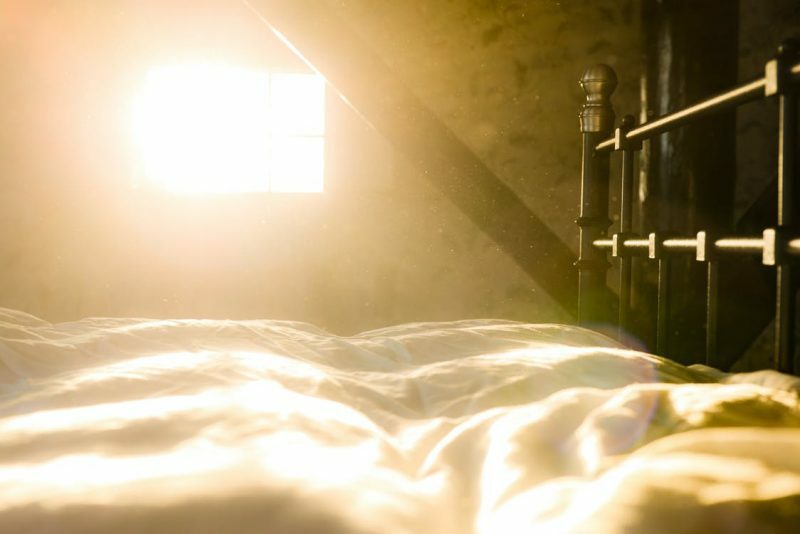 You may have noticed the dust-laden sun rays streaming into the room on a chilly and sunny winter morning. Add to these the invisible, but still very much present, bioeffluents that we ourselves emit, and also some volatile organic compounds generated by bedding materials. Meanwhile, we are asleep and cannot intervene immediately to improve the air quality. This illustrates the urgency of looking into bedroom ventilation and air quality. Ventilation, the air quality of bedrooms, and the effect on sleep quality is still a little-explored field of research within the built environment. Nevertheless, first results, such as those presented in the work of Strøm-Tejsen et al. , show its potential effect. To further explore and investigate the importance of good ventilation in bedrooms, we continued the work of Strøm-Tejsen et al. and investigated the sleeping outcomes for two different conditions in bedrooms: keeping a door or window in the bed room open or closed. The focus was on carbon dioxide levels in the sleeping room as a proxy for the indoor air quality (IAQ). 18 healthy young adults (final results analyzed for 17 persons) participated in the study. Measurements continued for one week for each condition for each subject, with a two week gap between the two randomly-chosen conditions (see schematic). Apart from measuring the carbon dioxide levels, dedicated attention was given to obtaining subjective and objective estimates of sleep quality of the participants. Validated questionnaires, such as the Pittsburgh Sleep Quality Index (PSQI)  and the Groningen Sleep Quality Scale (GSQS) , were used alongside a daily questionnaire on sleep depth. Objective data such as metabolic activity, skin temperature, etc. were measured through actigraphy (Sensewear Armband). That technique also allowed us to provide information on sleep parameters such as sleep latency, length of sleep, number of awakenings, and sleep efficiency. Other indoor environmental conditions were measured in parallel (temperature, relative humidity) or beforehand (noise level) and assumed as boundary conditions in the analysis. The most important requirement in order to continue the analysis was whether the two conditions (“Closed”/”Open”) would end up with significantly different CO2 concentrations. That they did. An average and statistically significant (p<0.05) difference was obtained of 416 ppm between the mean CO2 concentration under the two conditions [1147 ppm for the “Closed” situation versus 731 ppm for the “Open” situation]. The outcomes of differences in sleep quality between both conditions were not statistically significant for several of the investigated parameters. The exceptions were the subjectively rated sleep depth and the objectively measured sleep phase. Both improved with improved bedroom ventilation (better IAQ). Correlations between several of the investigated parameters were found not to be strong but still heading in the direction that would warrant further research to arrive at a better sleep quality environment through improved ventilation. What is interesting is that this study also found that the outcomes from the applied subjective and objective methods correlated well. This means that we are able to use more objectively obtained information, for example, from actigraphy, to analyze sleep performance. This may simplify continued efforts to better understand the important relation between bedroom ventilation and indoor air quality, reducing dependence on occupant feedback and intrusion into occupants’ time. The assumption is that if we will be able to provide good indoor air quality conditions in the bedroom for better sleep, that will be a huge benefit to all of us! These findings are described in the article entitled Window/door opening-mediated bedroom ventilation and its impact on sleep quality of healthy, young adults, published in the journal Indoor Air. This work was conducted by M.G.L.C. Loomans and A.M. van Ruitenbeek from the Eindhoven University of Technology, A.K. Mishra from the Eindhoven University of Technology and Berkeley Education Alliance for Research in Singapore, and H.S.M. Kort from the Eindhoven University of Technology and Utrecht University of Applied Sciences. The contributions and extensive cooperation from our co-investigators — Prof. Helianthe Kort and Aike van Ruitenbeek — is gratefully acknowledged. Strøm-Tejsen P, Zukowska D, Wargocki P, Wyon D. The effects of bedroom air quality on sleep and next-day performance. Indoor Air. 2016;26:679‐686. Buysse DJ, Reynolds CF, Monk TH, Berman SR, Kupfer DJ. The Pittsburgh Sleep Quality Index: a new instrument for psychiatric practice and research. Psychiatry Res. 1989;28:193‐213. Mulder H, van der Meulen WREH, Wijnberg JR, Hollander JJ, De Diana IPF, van den Hoofdakker RH. Measurement of subjective sleep quality. Eur Sleep Res Soc Abstr. 1980;5:98. Marcel Loomans is assistant professor in the group Building Performance in the Department of the Built Environment, Eindhoven university of Technology (TU/e). His areas of expertise include building technology, environmental studies, indoor environment, building physics, computational fluid dynamics, sustainable energy and performance based building. His research interests focus on the performance of the indoor environment (mainly thermal and air quality), as well in the design as in-use phase. As it is very much multidisciplinary, this topic needs close collaboration. It touches on several fields of expertise. Indoor environmental quality in health care environments (from the operating theatre to patient rooms) has been investigated, as have the sleeping environment in dwellings and spatial and temporal transients that users undergo when using buildings in real-life, to name bust a a few examples. Real-life in-situ assessment, combining physical sensors and the human sensor (perception and/or physiological) is another area of attention.